The worst tornado season, the most severe earthquakes, the worst tsunami, nuclear meltdowns, the worst floods, the worst droughts, upheaval in the middle east on a scale never seen before with the globalists deliberately destabilizing the nations surrounding Israel, what was once the world's most stable form of currency, the American dollar, is being driven into the dirt by the bankers, record solar flares erupting on the sun. The body of evidence is pretty convincing that something unusual is going on here. And you don't need to be a Bible scholar to take what Christ predicted would occur in the last days and see a startling similarity. The things of this world that people have taken security in are being stripped away. The non-believers will of course try to make you doubt the obvious, but even they will have to wake up to reality at some point. The Bible has made many predictions about many things and has gotten them right, even down to minor details, and we should look again at what it has to say because it is far more trustworthy than most people are prepared to accept. Read Matthew 24, or the book of Revelations, and these alone will show a composite view of the world we live in today. Believe in God or not, these things are obviously coming to pass sooner than we think, so forget the mainstream churches and get back to the Bible and start considering it. Something truly unprcedented is happening. All of these natural disasters should not be happening at the same time. On top of this, all of these natural disasters are coming at a time when the world economy is coming apart at the seams. The truth is that major economies around the world are teetering on the brink of devastation at the same time as these natural disasters. God will let His people know when the end time is near, and I believe that is exactly what He is doing now. 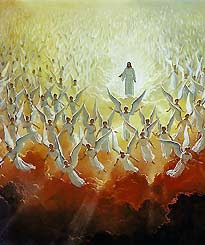 No one knows the exact day or hour of the second coming of Christ, but you can see that it is near. ”And a great earthquake occurred; and the sun became black as sackcloth of hair, and the entire moon became as blood, and the top-ranking ones and the military commanders and the rich and the strong ones and every slave and every free person hid themselves in the caves and in the rock-masses of the mountains.” — Revelations 6:12-15. Matthew 24:10-34: At that time many will turn away from the faith and will betray and hate each other, and many false prophets will appear and deceive many people. Because of the increase of wickedness, the love of most will grow cold, but the one who stands firm to the end will be saved. And this gospel of the kingdom will be preached in the whole world as a testimony to all nations, and then the end will come. “So when you see standing in the holy place ‘the abomination that causes desolation,' spoken of through the prophet Daniel—let the reader understand— then let those who are in Judea flee to the mountains. Let no one on the housetop go down to take anything out of the house. Let no one in the field go back to get their cloak. How dreadful it will be in those days for pregnant women and nursing mothers! Pray that your flight will not take place in winter or on the Sabbath. For then there will be great distress, unequaled from the beginning of the world until now—and never to be equaled again. “Now learn this lesson from the fig tree: As soon as its twigs get tender and its leaves come out, you know that summer is near. Even so, when you see all these things, you know that it is near, right at the door. Truly I tell you, this generation will certainly not pass away until all these things have happened.